Sherrie Carris received her B.F.A. from the University of Texas, and her M.A. and M.F.A. from the University of Iowa 1n 1972. Along with her husband Tom they have owned and operated Carris Pottery for over 30 years. Sherrie's floral pottery has been widely collected including a large carved porcelain planter in the TN governor's mansion. The State of TN bought one of her pieces to give to Patricia Neal. Artist in Residence at the Children's Museum of Oak Ridge. The Knoxville Museum of Art is showing two very subtle and important exhibitions. Both of the exhibitions are about social justice and the cultures of their country, united States And China. Each exhibition is about history, culture, work, government, and the role of the artists and the workers in these two countries. The documentation and titles on the pieces show the changing values in culture in the modernization in the country. The KMA is exhibiting an interesting and timely show to view. The artist, Ai Weiwei, is a photographer, a sculptor, a film and video maker, a performance artist,and a socially critical blogger. He collaborated on the design for the "Bird Nest" stadium for the Beijing Olympics. 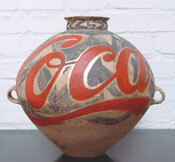 He was critical about the distruction of some of the historic districts prior to the olympic"Ai Weiwei: Dropping the Urn (Ceramic Works, 5000 BCE-2010 CE)". He made a video of the results of the earthquake in the sichuan province and the death of over 5000 childrens whose schools collapsed in shoddy construction. His work has been shown in many galleries and exhibitions. The pieces in this exhibition deals with the conflict between history and culture and the government's rapid push toward westerization. Ai Weiwei' pieces show the history and culture and values of China being covered or no loner valued by the government or the corporate elite of China. These are strong pieces and statements from a strong artist. I hope he will be released from confinment by the government soon. The long piece of weaven cloth is two part event. The first part was the collection of cloth and threads from mill and companies which have closed or will be closing soon. Anne Wilson documented the companies and the fabric and processing the threads to be used in the weaving. The weavers and their comments on the project is very interesting. The documentation illustrates have the textile industry went from hand=made and local fabric to factories creating the fabric to cloth the country and back to individual weavers. It is evocotive to see the changes in workers lives and the communities. The second part is the weaving, comments made by the weavers, and the long piece of fabric. Do check both of these exhibitions out.